Large Group Holiday House Accommodation, Big Holiday Cottages and Party Houses. Staffield Hall is a large and splendid Victorian Manor House. It has been converted in to the complex of individual apartments. 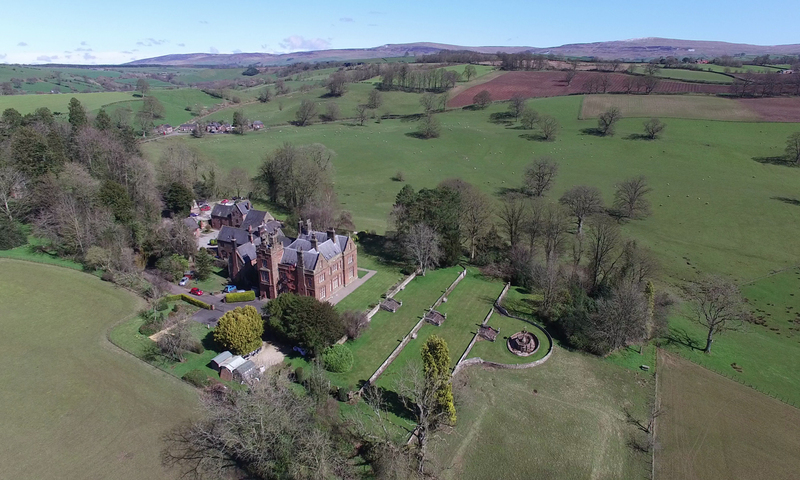 The main property on the ground floor is called Manor Hall and this can comfortably dine 18 guests in its main dining room in front of the fire and with splendid views to both the east and south parkland and down the Eden Valley. What a majestic and memorable setting for a family group or group of friends to spend time together. Manor Hall sleeps 6 guests in three splendid en-suite bedrooms. The apartments on the upper floor sleep between two and four guests each and when used for group booking allow the Hall to feel like one large house once more. The real beauty though is that because of its design the individuality of the apartments afford members of your group space and privacy from one another when required. Staffield Hall is located in the Eden Valley in Cumbria and just set aside from the Lake District National Park. Ullswater is our closest lake and this is within easy access by way of a 20 minute scenic drive. We have good access to the M6 motorway so when you have all traveled fro different parts of the country once you leave the motorway you are close to us. We take groups over a 3 night or longer weekend stay and we can offer 3 and 4 night mid week stays. If required pets may be also able to stay with arrangements with us. We have local catering contacts who can help with preparation service and even clearing up from your dining arrangements as required. Locally we have a choice of restaurants, some who can also provide private dining arrangement for you. please let us know of your requirements and we can then help with your plans. Large Group Holiday House Accommodation, Big Holiday Cottages and Party Houses.